Approximately 17,000 square feet of SageGlass® LightZone™ was installed on the western and southern elevations of the façade of the Saint-Gobain & CertainTeed North American Headquarters in Malvern, Pa., to minimize heat gain and glare and improve occupant comfort and overall sustainability goals. The sustainability consultant on the project, The Sheward Partnership, LLC, offers insights into how SageGlass helped the building achieve its energy-efficiency goals and contributed to the architect’s overall aesthetic vision. 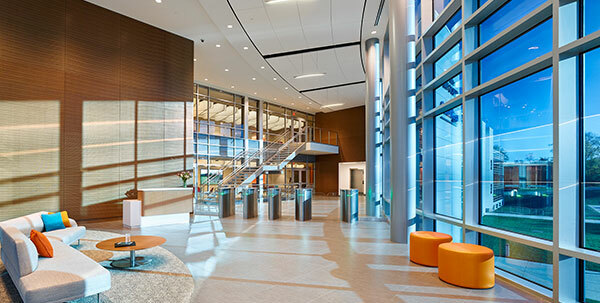 Q: Why did you choose for SageGlass to be installed at the Saint-Gobain & CertainTeed North American Headquarters? Why was SageGlass chosen over traditional windows with blinds and shades? A: SageGlass was brought in during the initial planning process to enhance energy performance, which was one of the major goals established by Saint-Gobain when developing their new North American Headquarters. We investigated a number of different glazing solutions which we tested in our energy model in order to select the best product with the best performance. SageGlass was selected for its ability to improve indoor environmental quality as well as provide unobstructed views of the outdoors. The LightZone function provided the ability to create up to three tint zones within a single pane of glass, letting in exactly the right amount of light and blocking the sun only where it needs to be blocked. The use of SageGlass also eliminated the need for shading devices, and because SageGlass is automated, it eliminated the age-old office battle of who wants the shades up and who wants them down. Q: How did SageGlass contribute to the Headquarters’ sustainability goals? A: Since Saint-Gobain wanted to pursue LEED Platinum certification, we incorporated SageGlass into the LEED energy model and determined that SageGlass contributed to 10 percent energy cost savings and additional LEED points in the certification process. Achieving double LEED Platinum certification for core and shell and commercial interiors is very challenging and not many buildings in the world have done it. SageGlass contributed to the high-performance nature of the building, which was able to achieve this prestigious certification. Q: What do you think is unique about the SageGlass installation at the Headquarters? A: SageGlass allowed the Headquarters to have a two and a half story atrium that faces a western exposure and is a comfortable space for employees and visitors. Without SageGlass, there would have been intense sunlight coming into the space all afternoon, and this space would have been a huge heat sink in the summer. The SageGlass installation adapted to the existing building footprint and provided the most energy efficient approach possible. Q: How did the installation help the architects achieve their overall aesthetic vision? A: Glass is intended to be looked through, not looked at. SageGlass looks like a traditional insulating glass unit (IGU), which helps the headquarters maintain a sleek and streamlined façade without the need for blinds or shades. Since the headquarters is located in a pristine natural landscape with a pond, stream and walking path, the clear glass helps to emphasize the surrounding views and allows employees to maintain a connection to the outdoors. 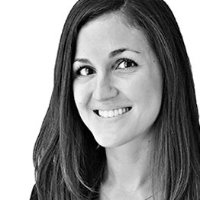 Chloe Bendisitis is a LEED Accredited Professional who believes in the triple bottom line of people, planet and profit. She has more than 10 years of experience in the architectural field with a focus in sustainable design and energy-efficiency. Chloe has in-depth knowledge of 3D computer simulation daylight modeling and uses this as a tool to evaluate design decisions and promote occupant health and wellbeing.